Rose and her husband Bob live in a two-bedroom, beachside condo in the upscale Tres Cocos neighborhood of Ambergris Caye, Belize. Rose and Bob quickly adjusted to Ambergris Caye’s easy-going Caribbean lifestyle. “Living here grants me the time to look beyond my to-do list…look beyond social media…look beyond commercialism…to focus on what is meaningful to me,” says Rose. Rose’s perfect posture and graceful poise are a giveaway that she spent years training, and then performing, as a ballerina. She later owned a Bay Area dance school in San Francisco, teaching others. After starting a family, she sold the dance school and became a personal trainer, yoga instructor, and Pilate’s teacher. It wasn’t long before the owner of a local fitness center found out about Rose’s past work and asked her to teach a Pilates class. She hadn’t planned on working when she first came to Belize but she enjoys teaching. And, as the only trained Pilates instructor on the island, she’s in demand. “The best part of teaching is when someone comes up and hugs me because they have discovered the powerful person who has been hiding inside all these years,” says Rose. Rose and Bob never run out of options for things to do. The Paradise Theater is a short walk from their front door. On Thursday evenings, they drop by Marbucks coffee house, where they enjoy live music, wine by the glass and socialize with close friends. On Wednesday nights, they often grab a light dinner at the Truck Stop food park and beer garden—like a spicy Cambodian noodle dish. Afterward, they watch a classic movie shown on an open-air screen, by the lagoon. Friendships have come easy on the island. Rose and Bob regularly get together with friends for a meal, party, or excursion. 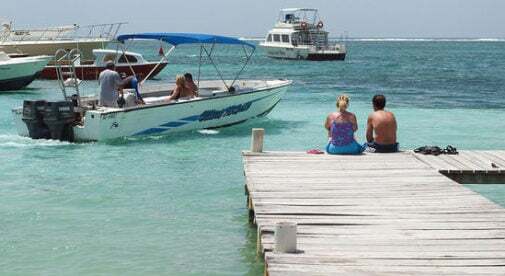 A favorite group trip is a boat excursion to the sandbar, where they while away the afternoon relaxing in the shallow, sandy-bottomed sea. And, earlier this fall, Rose joined a few close island girlfriends for a short, action-packed trip to Cuba. With so many opportunities for adventure and social interaction, Rose’s extra income from teaching Pilates has been a blessing. It’s made it possible to join more boat excursions, eat more dinners out with friends, take more international vacations…and really enjoy her life here.